That Vitus Bering (1681-1741) sailed into the Bering Strait is no secret, but few outside Russia know how he did it. Even veteran history buffs will blanch as Canadian historian Bown (White Eskimo: Knud Rasmussen's Fearless Journey into the Heart of the Arctic, 2015, etc.) 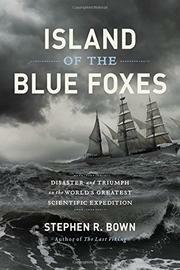 recounts the spectacular, often gruesome details of Bering’s massive expedition. A handsome, healthy Dane, Bering “was one of the many talented foreigners attracted to Russian service by Peter the Great’s expansion of the Russian Navy.” By 1731, he had already led a Far East expedition that returned with tantalizing findings. Russia’s government immediately planned a second expedition, which was far more ambitious and featured impossibly complex goals that ignored the painful lessons of the first. Readers will share the author’s amazement at what followed. In 1733, more than 1,000 explorers, soldiers, scientists, and craftsmen left St. Petersburg with tons of supplies, taking three years to trundle across 6,000 miles of Russia, quarreling, suffering, and wreaking havoc over roadless, thinly populated Siberia as they commandeered food, horses, and laborers along the way. Reaching the Pacific Ocean, the expedition built several oceangoing vessels. One group sailed south and made Russia’s first contact with Japan. Another, under Bering’s direction, sailed through the strait that eventually bore his name, confirming that Russia was not connected to America and reaching Alaska (it turns out he was not the first). Shipwrecked on an isolated island, Bering and many crew died before the remainder straggled back. In familiar fashion, Russia’s autocratic leaders suppressed the new geographic and scientific information, although it gradually trickled out over the decades. Luckily for readers, diaries, letters, and official reports provide Bown ample material for a gripping account of “the most extensive scientific expedition in history,” whose impressive results were certainly matched by its duration and miseries.